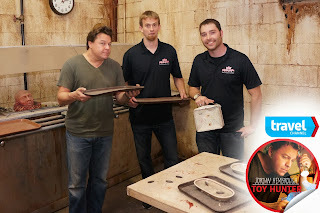 This Sunday Travel Channel’s Toy Hunter show stops out to The Dent Schoolhouse. Jordan takes a walk through the haunt before it opens and then goes back into the prop storage in hopes to find some killer antique toys! Also, the show features the local Horror Hound Convention featuring horror related items, masks, and comics. It all starts at 8pm Sunday the 20th on Travel! Next Huffington Post Names Dent In America’s Best!